Automating and Streamlining the Utility Assistance Process for Community Care Agencies. 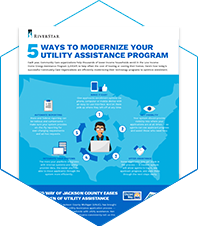 RiverStar Utility Assistance (RUA) was built from the ground-up to make the Low Income Home Energy Assistance Program (LIHEAP) simple and easy for both applicants and agents — designed to maximize efficiencies and increase the number of applicants processed year after year. Offer multiple application options, via phone, self-service desktop or mobile device — with the industry’s most intuitive, easy-to-use interface. Scale your operations confidently with a system that grows with you as your enrollment increases. Determine eligibility quickly with advanced screening and application logic. Increase revenue while decreasing costs with a more efficient and streamlined approach. Learn how today’s successful Community Care Organizations are efficiently modernizing their technology platforms to optimize LIHEAP enrollment. The entire process can be automated, without the need for human intervention. Our easy-to-use desktop or mobile interface makes LIHEAP applications simple. Eligibility is determined quickly and automatically with a simple, up-front screening. Agents have full visibility into the application progress to assist applicants. Reports meet all state-level requirements or any ad-hoc needs. Send reminders and acceptance notifications via text or email. Get our in-depth datasheet for more information, and read the case study from the United Way of Jackson County, MI.